2nd Edition: Advanced Techniques for Traditional Black & White Photography including digital negatives and hybrid printing. Photo Techniques Magazine stated: "All our readers need to know about this very useful book." Indeed, there is no other compendium that is as in-depth as this for the beauty and magic of fine-art black-and-white photography. Classic study of the negative by Ansel Adams about how to correctly expose and develop film using the zone system. This one should be on everyone's shelf. Teaches photographers how to recognize zones both on the print and in the field or studio, to pre-visualize and expose accordingly, to access their prints and negatives for contrast, and to test equipment for reliable results. Makes the science of photographic sensitometry both accessible and useful to interested photographers. This book will appeal to any serious photographer interested in knowing how the materials and processes of black-and-white photography work. Plastic cameras such as the Lomo and Holga have built-in inadequacies such as light leaks, vignetting and chromatic abberation. This book helps you explore the free and fun world of toy cameras. The original cookbook contains all the recipes and data you are ever likely to need in the darkroom. Lots of info covering film and paper processing with additional sections on specialist techniques. Follow up publication to the immensely useful Darkroom Cookbook. If you like to mix your own dev or tinker with chemistry, then this is a must. Formulae galore! Comprehensive guide explains all the procedures and techniques for black & white printing in the darkroom. Suitable for all levels of photographer, this book includes sections on exposure and development, choosing materials, calibrating equipment, storage and display. FREE DOWNLOAD. A great book for serious printers. Lots of techniques and info. Ctein's expertise and clear style make this a superb reference. Updated edition of this modern classic provides instructions for many historic and alternative photographic processes with new sections on digital negative making, electrophotography and self-publishing. Designed as a book of ideas to help stimulate and understand innovative ways of thinking about and using photography. Includes key examples from many leading practitioners. Excellent reference on pinhole photography now updated to cover both tradtional and digital techniques and applications. Good general purpose guide to IR photography, includes lots of examples, details of filtration, digital cameras, night photography and film and developing techniques. Unique introduction to Photoshop for photographers experienced in traditional media, lots of examples and plenty of detail. Fully updated. Excellent primer with the author's own illlustrations providing information on RAW file conversion, creating images in Photoshop and Lightroom, HDR, toning and tinting. Useful for all levels of digital photographer. Step-by-step guide takes you through the entire process of restoring or repairing old photographs using Photoshop, Picture Window or Elements. Ctein is a highly-respected printer and long-standing contributor to Photo Techniques magazine, as well as running his own photo restoration business. eBook with hands-on techniques for maximizing image quality using RAW. Real-world examples illustrate how best to maintain image tone, contrast and sharpness. A great clear and comprehensive guide to large-format. This is a classic book and provides all the information needed to use a large format camera. Advanced and technical explanations to many aspects of photographic production. Ideal for serious students, professionals or technically-minded enthusiasts. 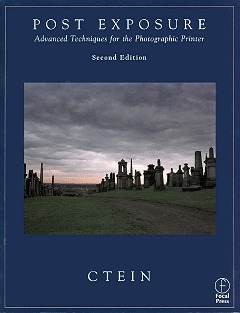 Edited by faculty from RIT, this is an indespensible technical guide and index to every aspect of photography. Updated many times over the years, the current edition includes a huge amount of new material relating to digital imaging.